So we weren't around during ancient Greek times to actually catch a glimpse of Aphrodite, Athena, or Hera, so we're not exactly sure what Greek Goddesses look like, but the generally consensus here in the office is that these lustrous ladies would've had some magnificent heads of hair. Such marvelous locks would of course take years to groom and prepare. We don't know about you, but we have other things to do. So if you want a fancy do for your Greek goddess outfit (or really, any goddess outfit), then look no further than our Athenian Goddess Wig. 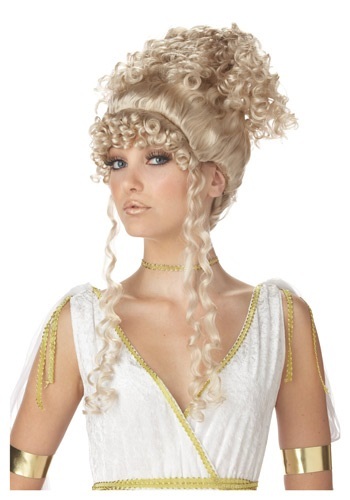 It's a 100 percent blond synthetic wig with curly hair, bangs, and long cascading strands. Just throw this on over your own hair and you'll instantly look as glorious as a Greek goddess... we think. As we said, we weren't there.